What would you call an online library that searches Amazon, the Library of Congress and 45 other world libraries -- and also your book catalog! 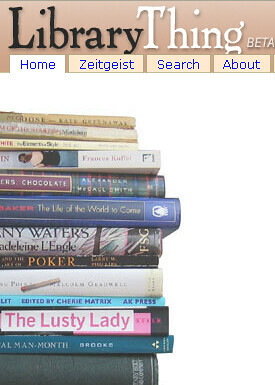 What if you could tag all your books in much the same way as the famous social tagging sites -- del.icio.us and Flickr? Well, that's LibraryThing.com! You can tag up to 200 books for free -- and as many as you like for $10 (year) or $25 (life). And as the informative tour on the site says -- your profile connects you to people who share your books. With 50,000 users and 3.2 million books in the system, you'll find some "eerily similar" libraries. The Wall Street Journal adds -- If bookcases are a way to casually display interests dear to the owner, the Internet throws open the doors on reading habits. Social-networking and book retailers' sites are already rife with lists of readers' favorite material, allowing people to compare notes on taste and compatibility. But for Tim Spalding, a computer programmer and bibliophile, listing a few titles in an online profile isn't enough. He sought a way to catalog his entire book collection -- and to check out what was lining other people's shelves.